HMH Books for Young Readers, 9780547733951, 32pp. One rainy day in the city, an eager little boy exclaims, “Rain!” Across town a grumpy man grumbles, “Rain.” In this endearing picture book, a rainy-day cityscape comes to life in vibrant, cut-paper-style artwork. The boy in his green frog hat splashes in puddles—“Hoppy, hoppy, hoppy!”—while the old man curses the “dang puddles.” Can the boy’s natural exuberance (and perhaps a cookie) cheer up the grouchy gentleman and turn the day around? Linda Ashman is the author of many picture books, including Babies on the Go, illustrated by Jane Dyer, Castles, Caves, and Honeycombs, illustrated by Lauren Stringer, which was named a Booklist Editors' Choice, and Rub-a-Dub Sub, illustrated by Jeff Mack. She lives with her family in North Carolina. Visit Linda at lindaashman.com and on Twitter at @lindaashman2. Christian Robinson likes to stay indoors on rainy days and look out the window while drinking a big cup of hot cocoa. He has illustrated this book, as well as a few others, while staying indoors on rainy days. In 2016, he won a Caldecott Honor for Last Stop on Market Street. Christian lives in San Francisco, which has more fog than rain. Visit Christian at theartoffun.com. "Good and bad moods alike can be contagious, as this rainy-day story handily demonstrates." "This will be ideal to share in late winter when everyone is suffering from the winter blues and needs a reminder to make the most of the gloom and gray." 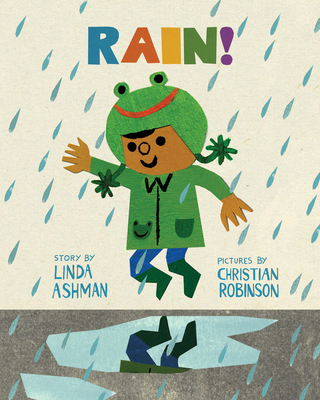 "Two very different attitudes about the weather go head-to-head in Linda Ashman's buoyant Rain!"